Resident Cabe sends in this photo of the hoardings finally moving back at this comedy building site on the Caledonian Road (my words not Cabe’s), former site of TG Lynes pipe fitting suppliers and plumbers. The site has been ‘under development’ for years with huge hoardings jutting out into the pavement. As its in a conservation area I presume that the planners will enforce a return for the charming period shop fronts of this facade that adorned Lyons and were preserved by the longevity of their tenancy. These buildings have a complicated planning history – including attempts I think to turn them into an NHS drop in centre and a restaurant. We wrote about them in 2007 and the latest is P102751 from two years ago. Do any readers know what’s happening? Nicer that a bit of pavement is back, but of course would be better with a good tennant….. The building has been developed by Land & Equity Holdings Ltd a relatively small developer based in Finchley. The Council has repeatedly urged the owners to return the hoardings to the proper building line and finally they have done so. I spoke to the developers in July last year asking them to get a move-on and let the shops. They rely on bank financing and their lenders insist they secure tenants who can offer “good covenants” i.e. blue chip operators who will sign-up to long leases and thereby give the developer an almost guaranteed long-term rental income (and guarantee the bankers their money back). I argued that we want a bit more variety than just chain multiples and why not find a way to accomodate smaller, newer businesses with more character and interest? You would think that a developer would be keen to get the units away but with such restrictive financing, they seem hands-tied. Obviously the residential accomodation on the upper floors will be delivering a very large income stream but I get the imperssion that part of the development was separately financed. Nonetheless, the developer claim to be actively marketing the units although, of course, they did not secure the widest range of uses they originally wanted. The Council warned them that A5 (Hot Food Takeaway) and A4 use (Drinking Establishments) would not get planning permisison so they withdrew those applications and settled for A1 (retail) and were then given additional consent for A3 (Restaurant). 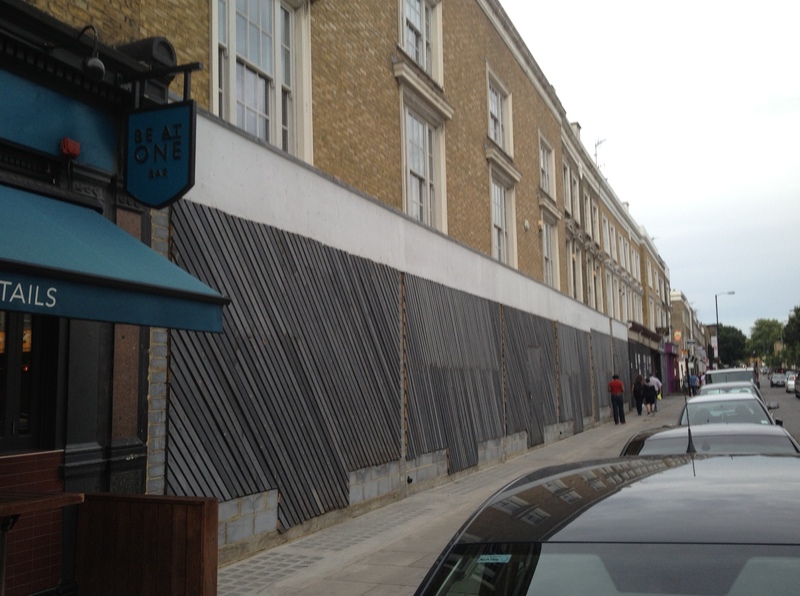 Now the hoarding has been moved back, it reveals that block pavement lights have been installed as part of the planning permission and the style of shop front will be “traditional”. It’s worth looking at one of the drawings submitted for planning permission in 2010 which is at http://planning.islington.gov.uk/NorthgatePublicDocs/00083374.pdf as this shows the detailing of the shop fronts. To me the plans for the shop-fronts don’t look traditional, they look modern! Why did the council allow the hoarding to block the pavement for so long? Surely enforcement action should have been taken long ago! Land and Equity Holdings wind-up petition entered Jan 2013…??? I think much the space upstairs may actually be commercial space, which is accessed via 2-8 Balfe Street. This had been a large email management company (Mimecast) which moved out earlier this year after outgrowing the space. Mimecast used to have 2-10 Balfe Street, but 10 Balfe is in the process of being carved off into a separate unit. (It’s not yet clear whether 10 Balfe will be residential or commercial; it was approved to be returned to residential in 2007, but obviously was still commercial until earlier this year.) In any event, unless Mimecast is still paying their rent, I don’t think Land & Equity Holdings is taking in much rental income currently. Bumped into a small team doing a survey of the building, they told me it has recently been purchased. Can’t find any other information to confirm this. I’ve got mail from the Council here dated 11 Sept announcing that someone called Think Eat Drink is applying for license at 47-51 Caledonian Road. It may be this organisation of the same name, which announces plans for a restaurant and is currently based on York Way. Could be a nice addition to the neighbourhood (better than an empty shop front) but it’s not clear to me why they need an off license to do that. They also want to serve food until midnight, which could be wonderful or unnecessary depending on the food and style. An update: It’s one restaurant (/bar) across all three shopfronts, and across the ground floor and basement. Looks like a nice addition to the neighbourhood: mostly food (floorplan shows a large kitchen) and lots of booths. The proposals are to develop the site at 47-51 Caledonian Road into a Bar Restaurant with A3 use over ground and basement level. The existing dilapidated shop front will be removed and replaced with new that has bi-folding windows in the central section, 2 no. existing pavements light will also be replaced. A new external metal staircase from basement to pavement level will provide access to existing under pavement vaults for refuge storage and removal, this will also provide additional escape from the basement area. The staircase will have decorative metal railings and a lockable gate painted black. 3no new a traditional Victorian style awnings will be installed, these will have signage printed on, new signage to the 3no. fascias is also proposed. To the rear a new extract duct, air conditioning unit and air fan/filter unit will be installed on 2no. flat roofs. Internally the toilets will be moved from basement to ground floor and a disabled toilet will be provided. A new bar fitting and kitchen will be installed. An existing staircase between the floors will be removed and vaults under the pavement will be brought into the trading space. IoP has begun discussions with Islington Council to modify the current building. Cally Councillors now have a copy of the proposals which mainly involve an additional storey on the main building. At their public consultation on 19th May further details should be available. Thanks for that detail – the interior drawings did look like they had added some height to the building. I’ll look forward to the consultation to see whether they have assessed the impact of that on the back gardens and small park area they will be (ever more slightly) looming over.